We come bearing good news. We have just launched the Skrilla Marketplace! It’s now possible to redeem gaming gear in exchange for hard earned SKR tokens won, playing esports daily fantasy @ Skrilla. The items for purchase consist of a revolving range of gear, software, gift cards, tickets to major events and more! The items will change at random so there is always something new to check out / redeem. Keep your eyes peeled for great deals and unique items we have the team on a quest to find. In order to be in the mix to acquire gear, you need to put your esports knowledge to the test in our free and paid daily fantasy Contests. In further good news we will continue to run regular free to play contests worldwide, with larger prize pool contests occurring at least once a month. Based on your feedback we have also made a range of improvements to the mobile site. The most significant is to our ‘roster builder’. 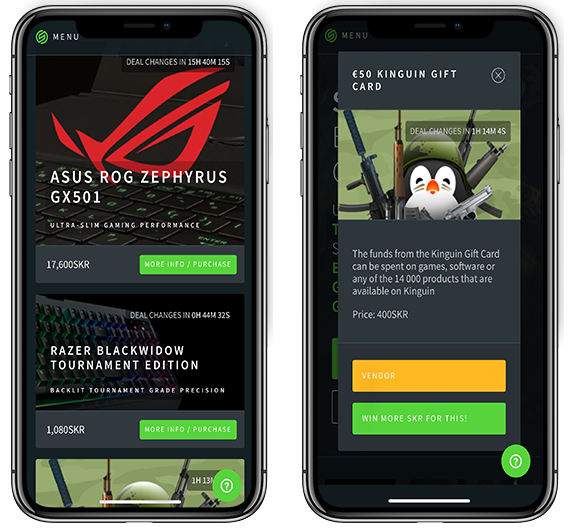 We have shifted from an interface of swiping and selecting from full screen player cards, to a stacked set of smaller cards, with a range of additional functionality and information. The loud feedback we received was that while the earlier interface was visually appealing, the die hard fantasy esports fan need a comparable level of stats and easy player comparisons on mobile, to match our existing desktop web experience. We listened and delivered! You can now scroll and compare players easily, apply filters for quick sorting, and have significantly more information at your fingertips to build your wining rosters on the fly! In the pipeline for release in the coming weeks is the launch of a range of digital wallet functionality, allowing verified users to convert fiat to SKR and cash out to crypto, as well as a significantly improved live streaming experience for viewing your performance in real time and the live games on the go! To join the discussion on what has been a busy week for the Skrilla community visit our telegram or start playing to earn SKR now.